Hello everyone! 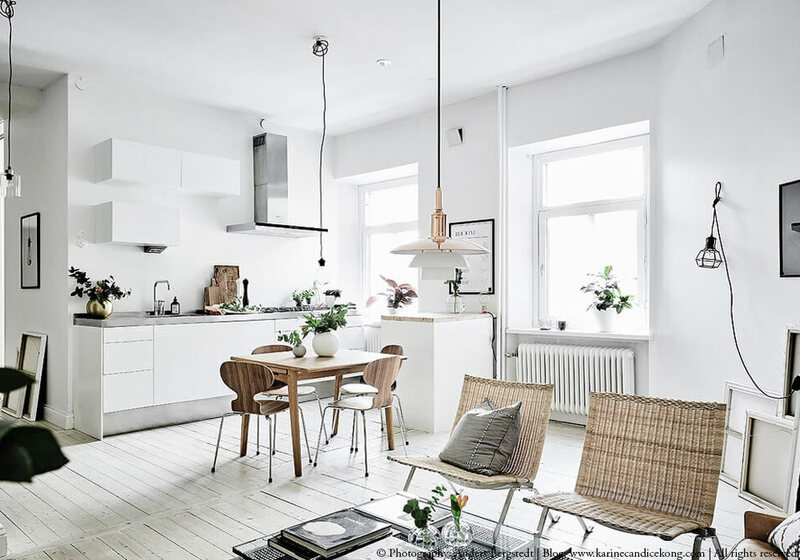 If you’ve been a reader of my blog for a while, you know that white interiors are my first love so today, I’m taking inspiration from this beautiful white apartment with lovely natural accents. I love how lived-in and cosy it feels. It’s not a big place but it is a beautiful space don’t you think? One thing that I really want to tackle this year is our lounge in France. Steve was given a massive TV by his best friend who moved back to New-Zealand and although it was a nice thought, this very large screen is a real eye-sore in our lounge (at least to me!). I suggested we put it on the wall and get rid of the stand but somehow, Steve who is normally handy and good at DIY is not feeling brave enough to drill into the wall. Looking at the position of the sofa and chairs, I think the black picture frame on the wall is a print and not a TV but should you have one of these TV screens, it would look great mixed with prints. A few things that caught my eye in this flat are the lovely bed linens and EVE has currently some nice linen sheets in various colours that are reversible. The large poster above the bed is available from Love Warriors and you can find the Missoni bath towels from here in the UK. If you love the uncluttered look, you may want to read this article: 15 helpful, practical tips to start decluttering your home which I wrote earlier this year. What are the things you love the most about this flat? Have a great weekend there???????????? I have been in a decluttering mood myself :-) It has been pouring down rain these past 2 days and now that Mila is back at school and I have unpacked our Summer suitcases, I have sorted out our paperwork, clothes she has outgrown, and threw and gave away stuff. I think I’m nesting for the winter. I’m normally more fond of a bit more color (though not too much) but with how bright and well-lit this space is, I can definitely dig it, especially since the light seems to be all natural light – the best kind! White interiors are always attractive to me. I enjoyed your article. I like that there is some wood in there, too much white feels a bit featureless to me. I hate our big tv, it’s so ugly, of course my husband thinks it could be bigger! We have ours on a simple side stand which is great for hiding other stuff. I’m not convinced the chimney breast could hold it’s weight and what to do with the cables? Our is as big as yours. My problem is that it’s one small corner and I can’t find a nice piece of furniture to have it on. Our childhood tv had a wooden case and a sliding door that pulled over the screen. Not that we did ever leave the door closed, but maybe they were onto something!! Can someone tell me which white is on the wall please? Karine, just read one article about your home in London, (French article on Milk) which white colour did you use for your home please ? I am currently buying mine and struggling with all the different whites… it’s to use in rooms with and without natural light. I tend to go for the Pure White from Dulux but the waterproof version which normally goes in kitchens & bathrooms. Its more expensive and washable which I feel with a dog and a kid is well-worth it. Unique pendants and lamps. They fit in so nicely with your furniture and the atmosphere feels so modern. Overall good stuff as usual really keen on them white interiors. Everything in its right place. No clutter no nothing, bravo! I’m a big fan of the lighting work I must say. The floorboards are the only thing I dislike tho, they seem too cold, otherwise everything look very homely and cozy.